Is Social Media A Perfect Platform For Your Business ? Almost every person get information about any new business or product via internet. The Internet is an only medium to spread the information quickly with the help of many platforms like website, social media website and more. When we talk about Social Media we found that almost everyone is active on social media platform. So it is very easy to connect with the people and getting any new update. Social Media is fire and, a rich platform for the promotion of any business or product. Without promotion, it is very difficult to increase the sales, leads or branding of your business. It is a great tool which provides you a successful business and continued growth. A businessman can easily promote their business through social media platform without any investment or with a little investment. One of the greatest advantages of using social media for promotion is that you can easily connect with millions of people and get to know their likes and dislikes. On the base of user’s likes and dislikes you can make changes in your product and service. 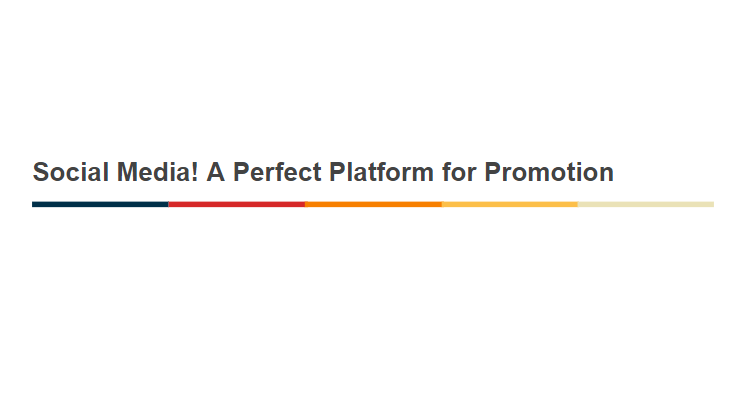 Whenever you decide to do promotion on social media, it is must that you choose a right platform for promotion. Choose that platform where you can easily target more customers. Facebook, Twitter, Pinterest, YouTube, and Google plus are the most powerful networking sites to connect with more people. These are the sites which used by almost every second person. You can run a free campaign or a paid campaign on these sites easily it depends on your budget. There are lots of Social Media Management Tools are available which are very helpful, you can use it too, to make your campaign more effective. Users love to read the short and subject oriented content. Always remember one thing that whenever you publish any new content on social media, keep it short and informative. So that user can get an idea about your brand or services. Make your content attractive and unique to attract more visitors. Visitors see thousands of content in a day, but they like to go through only those links which they found useful. If you provide them useful information about your brand or services and if they found it useful for them, hopefully they will reach to you and share your content with others too. To increase the number of followers it is necessary for you to share your content more. Maintain the regularity in posting the content and keep the engagement with users. To increase the numbers of followers on your page share the content of others too, and request them to share your content on their sites. Start follow the page of others in which you found a large number of existing followers. Try to share you content in the form of images too which would be more effective than having only content. These are some tips which may helpful for the promotion of your product or to increase your brand value. If you are new in business and want faster growth in the market then start the promotion of your products by using a social media platform to see faster growth. It is proved as an effective medium for both small and big businesses.